MEMPHIS, Tenn.—The Memphis City Council will vote this month to complete new tax breaks for Graceland to fund a $100 million expansion, a peace offering in a nearly two-year war that included threats of Elvis’s estate leaving his adopted hometown. It should go without saying — oh, I so hope it should go without saying — that Graceland is a place (“the place Elvis called home,” as Graceland’s own website touts it, complete with “the gardens where he found peace”), and you can’t move a place, though obviously you can move all the stuff that’s in the place. Whether people will still go visit the stuff if the stuff isn’t in the place is an open question, but apparently not one that Memphis wanted to consider too hard, because city officials approved giving Graceland several briefcases full of money in order not to go through with moving overseas. So to recap: A tourist attraction based around Elvis Presley’s home in Memphis threatened to move to a place that Elvis never lived, until the local government agreed to give them at least $194 million to pay for a $100 million expansion, which the local economic chief claims will leave the city and county turning a profit. 2019, people. Sally Jenkins of the Washington Post wrote a column about how Washington NFL team owner Daniel Snyder is a bad person and a terrible owner and should never get a dime of public stadium money because that’d be “a bailout, welfare,” none of which I can disagree with, but at the same time I’m a bit uncomfortable with the implication that if Snyder were less unpleasant, he’d then be deserving of public largesse. This essay responding to Amazon’s tax breaks is pretty excellent, though it’s still a half-notch below this classic Tom the Dancing Bug cartoon. An opposing team manager has demanded that Tottenham Hotspur be required to play the rest of their season at Wembley rather than moving into their much-delayed stadium, because … teams that got to play them while they were adjusting to their new grounds would have an advantage somehow? From what I’ve been able to tell, most of home-field advantage in soccer comes from home fans booing (or whistling) at refs to intimidate them into making calls that go their team’s way, but the last time I tried reading the literature on this it quickly went deep into the weeds, so I won’t belabor the point. “Fans at Talking Stick Resort Arena” were “surprisingly” in favor of spending public money to renovate the Phoenix Suns arena, according to Fox10 Phoenix, compared to “the online response” which was more “mixed.” This is both an impressively off-label use of “surprisingly” and an impressively lazy attempt at polling Phoenix residents — two impressively lazy attempts, even — so fine job, Fox10 Phoenix! Jeff Bezos will be getting more public cash than any single sports venue, but at least he’ll be employing actual full-time workers, so the cost-per-job ratio won’t be as dismal as in sports deals (though it’s still probably pretty bad). Just like we’ve seen in sports deals, here are tons of hidden costs to the Amazon agreements, from infrastructure slush funds paid for with public tax dollars to federal tax shelters set up by Donald Trump that will cover Amazon’s New York headquarters, even though they were supposed to be for impoverished areas and Long Island City is decidedly not. As in many sports deals, Amazon’s subsidies will evade most public oversight (in New York, anyway), and were arguably unnecessary at this level given that the company, like sports teams, undoubtedly ended up locating in the market that it wanted to anyway. Or if you want to skip to the ending: “The Amazon deal is ultimately another step in the legitimization of government by extortion, where the nation’s richest men can withhold ‘job creation’ as a condition of not having to pay taxes, or commute without a helicopter.” But go read the whole thing, it’s way more entertaining than the bullet-point summary above, or at least way more packed with pop-culture references. Attached to its press release, Amazon included the full memoranda of understanding for the New York, Arlington, and Nashville deals — since my purpose in life somehow seems to have evolved into reading these damn things and figuring out what’s hidden in them, I sat down to write up an analysis of the New York deal for Gothamist. The upshot: Between the city and the state, Amazon will cash in at least $2.5 billion in checks from the public (and probably more like $3 billion — see update below) in the form of tax breaks and other goodies. With Jeff Bezos in line for about another $1 billion from Virginia and a pittance of $60 million from Nashville — hardly worth counting the bills, honestly — that’s about $4 billion that America’s richest man will be raking in for the trouble of holding a year-long bidding war before doing whatever he wanted anyway. Modern subsidies are really hard to keep count of. Amazon’s press release fessed up to $1.5 billion in subsidies from New York and $573 million from Virginia, but that didn’t count $200 million from each state for bonus jobs created over 25,000, nor a $300 million infrastructure fund in Arlington, nor about $1.3 billion in off-the-rack tax breaks from New York City (I included $900 million of those in my Gothamist article, the New York Post’s Nolan Hicks found another $386 million), nor an additional infrastructure slush fund that will be created in New York from payments in lieu of property taxes. I’ve been staring at this thing all day and I still don’t feel 100% confident there aren’t additional hidden costs lurking about — which is par for the course for both sports and non-sports subsidy deals. Subsidies aren’t what determine location decisions. We’ve seen this before in sports, where team owners have used the threat of going elsewhere to shake down the cities they already want to be in for cash. But it’s especially bald-faced in this case, where other states offered as much as $8.5 billion for Amazon’s hand, only to have Bezos say, Sorry, our first love is big cities where techies want to live. At which point you have to wonder: If Amazon was going to go to NYC and D.C. anyway, why did those locales bother coughing up so much public money? As with sports venues, cities could be thinking, “These people on the other side of the table need us more than we need them” — but they’re largely not. Anyway: New York just threw a giant wad of cash at Amazon, Arlington can comfort itself that its wad is at least a bit smaller, and all the cities that missed out don’t get the new jobs, but do get to keep their money. There’s probably a lesson in here somewhere, but given that everyone involved is steadfastly refusing to learn it, it’s hardly worth spelling it out. The Florida state house has again passed a bill that would ban building or renovating private sports facilities on public land, which would potentially affect the Tampa Bay Rays, among others. 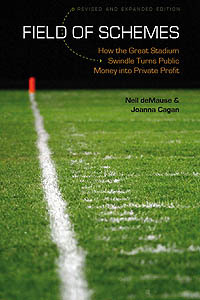 This is kind of a dumb idea, as we discussed back in October, since there’s nothing wrong per se with putting stadiums on public land so long as the public gets a good deal for it; a far better plan would be a Seattle-style bill to require that local governments get a return on their investment in any sports lease project. But then, this bill already passed the Florida house last year and died in the senate, so probably not worth getting worked up over too much just yet. Sports Authority agreed in 2011 to pay $6 million a year for 25 years for the naming rights to the Denver Broncos stadium, and now Sports Authority is bankrupt, and Metropolitan State University of Denver marketing professor Darrin Duber-Smith is saying I told you so: “My big warning was, ‘I’m not sure Sports Authority is a big enough or healthy enough company to commit that much money from their marketing budget each year.’ And I was right.” The Broncos are now looking for another company to pay $10 million a year for naming rights, and haven’t found any takers yet, hmm, I wonder why? Chelsea F.C. will get to move ahead with its new-stadium plans after the town council used a compulsory purchase order — like eminent domain, surely you’ll remember it from that Kinks song — to clear an injunction that a nearby family had gotten on the grounds that the new stadium would block their sunlight. The purchase order isn’t actually seizing their home, but the land next to it, which is enough to invalidate the injunction; not that this doesn’t raise all kinds of interesting questions about the use of state power for private interests, I’m sure, but man, don’t you wish this were the only kind of stadium controversy we had to put up with in North America? League monopoly power over who gets a franchise is a bad, bad thing. High Point, North Carolina is spending $35 million on a stadium to bring an indie minor-league Atlantic League baseball team to town, and City Manager Greg Demko says this will help the city’s commercial tax base recover, because “the construction of a stadium is like an anchor for the revitalization and development of a downtown.” Demko is going to be so disappointed, but at least he got mention of his city in a Bloomberg article as “home to the World’s Largest Chest of Drawers,” and you can’t buy publicity like that. New Seattle mayor Jenny Durkan says that while it’s “a longshot,” it wouldn’t be impossible for Chris Hansen to build his Sodo arena while OVG renovates KeyArena at the same time. I’m going to interpret the tea leaves here as “Hey, if you want to spend your money to try to compete with another arena across town, be my guest,” but stranger things have happened, maybe? The city of Austin has issued a report on eight possible sites for a stadium for a relocated Columbus Crew, and are now waiting on Crew owner Anthony Precourt to tell them which, if any, he likes. A consultant for Precourt has since ruled out a site or two, but it looks like nothing might be ready for the city council to vote on February 15 as planned; Austin MLS lobbyist Richard Suttle says the problem is “between the holidays, flu season and winter storms, it’s been slow going.” It’s not quite helping to spark women’s suffrage, but the flu still reminds us who’s boss from time to time. Now that Amazon has announced its short list of cities that will get to bid on its new second headquarters, it’s time for another look at how to stop corporations from launching interstate bidding wars to be their homes, which once again leads us to David Minge’s 1999 bill for a federal excise tax on public subsidies. “Of all those offers [made to Amazon] there’s one obvious one that should have been made and it should have come from Congress,” University of Minnesota economist and former Minneapolis Federal Reserve research director Arthur Rolnick, who helped Minge concoct that bill, tells CityLab. “Now if that offer were on the table it would end it, it would end the bidding war. Then Amazon would simply base its decision on where location is best for business.” It’d work for sports leagues, too!